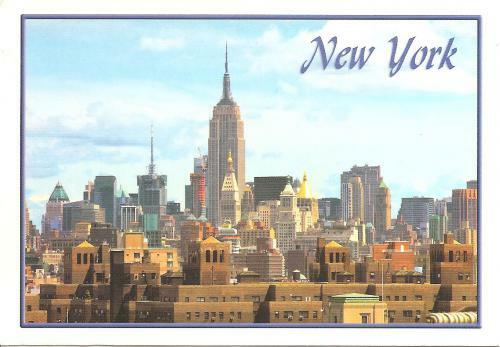 This is another postcard I won from a giveaway of a blogging friend. Seen is the Empire State Building, a 1,454 ft (443.2 m) high building that was once the world’s tallest. The fourth-tallest freestanding structure in the Americas, the Empire State Building is also one of the Seven Wonders of the Modern World. I received a wedding invitation from a friend and would love to go especially since there are advertised New York Vacation Packages for the month of September, the set date for the wedding is on the 20th. A package tour coinciding with the New York City’s US Open Tennis Tournament would be the most convenient deal. The deal includes accommodation for 2 nights and more at a Manhattan hotel of choice, tickets to 3rd round Men’s and Women’s action, food and other passes and also free admission to the Empire State Building Observatory, Museum of the City of New York and American Museum of Natural History, Metropolitan Museum of Art or Top of the Rock Observation Deck which are on my lists of to-dos. I just have to set that day off for the wedding and then go touring around the city again. There are a variety of seasonal and holiday New York City vacation packages and special events that you and your family can book. Why go booking separately when you can have a complete vacation package; accommodation, food, sight-seeing and other activities? New York Vacation Packages are your hassle-free option for a grand vacation at the Big Apple, just choose which month to go and you’re sure to find a special event or holiday package that you’ll enjoy.